This is our 100th Gift Ideas for the Book Lover series post!! THANK YOU for being part of the series! 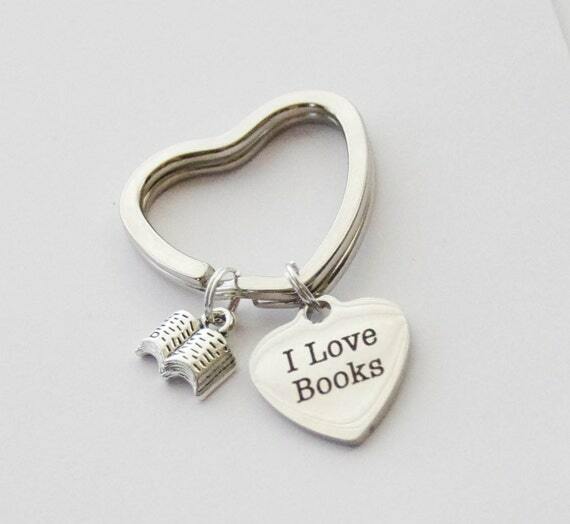 I hope you have found some awesome items for the book lover in your life or yourself! Speaking of items, check these out! he perfect gift for the reader in your life! This lovely keychain was handmade using a laser-engraved stainless steel pendant on a sturdy heart-shaped keyring. All Smitten Kitten Jewellery is designed and handmade with love by Kendall. If you are dissatisfied with your new treasure, let me know within 30 days of your purchase and I will exchange it or refund your money. All of my jewelry items are mailed using beautiful organza bags in protected envelopes. 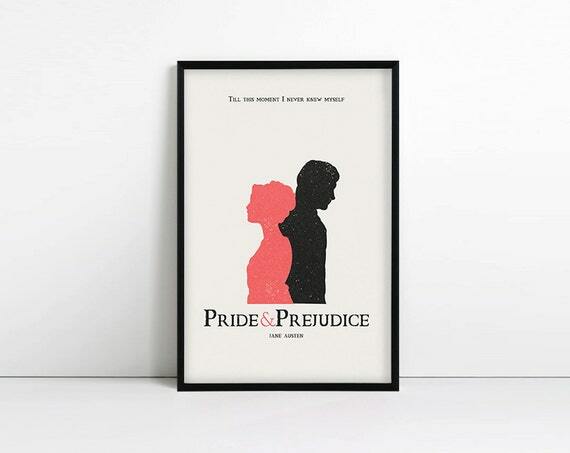 Pride and Prejudice minimalist poster, Jane Austen quote print. This illustrated typography print makes the perfect Jane Austen gift for any fan or book lover. The minimalist design looks great in any room of the house and the colours can be fully customised- just shoot me a message! These key fob Wristlets are a perfect way to secure your keys and easily find them in your purse! Each Wristlet is 1" wide and 5" long when laid flat (10" total). They are perfect for hanging on your wrist. All of my key fobs are made with nylon webbing, nickel plated hardware and grosgrain ribbon. For those who never go anywhere without a book, this book-inspired coin purse is definitely for you. 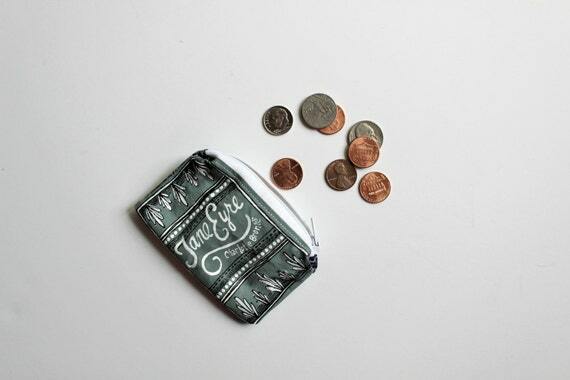 Jane Eyre by Charlotte Bronte can now carry your coins and various other goodies! This small zippered pouch is perfect for coins, credit cards, ear buds, jewelry, and so much more. It would make a wonderful gift for the book-lover in your life. Or get it for yourself as a special treat. This coin purse is fully lined with printed cotton. The front of the coin purse is custom cotton that has been digitally printed with my hand-painted and original design of the bookcover. The back is cotton and tagged with my business logo. 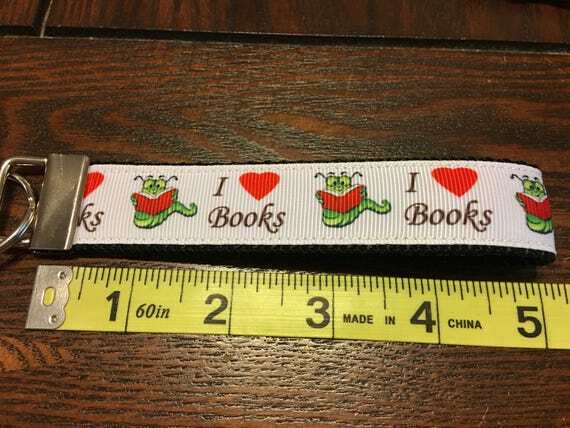 It measures approximately 4" by 5".